What Is Merch By Amazon? Opportunity Alert! Last updated on June 13, 2018 By Nat 2 Comments This post may contain affiliate links. We appreciate you supporting Rags To Niches! Full disclosure here. What is Merch By Amazon And Why Should You Care? Merch by Amazon is a fairly new addition to Amazon and is currently only available via Amazon.com (however, you don’t need to be in the USA to join!). Essentially, the platform allows you to upload tshirt designs very simply to sell via Amazon and you can either create the designs yourself, or you can outsource your designs. There are various places you can outsource, but one of the simplest ways you can find a good value designer is on Upwork. But to get the ball rolling, you may as well get started yourself and my personal preference was to get learning and design a majority of the shirts. If you think you’re hopeless at designing, fret not, even very simple text based designs can sell really well! The best part about Merch by Amazon is – that the creating and uploading of the shirts is the hardest part for you, Amazon takes care of everything else. Amazon prints the shirts, ships the shirts and deals with customer service. You then just pick up a certain amount of money per shirt. So, for example, if you are selling a basic shirt for $19.99, you get around $7. If you go cheaper, you earn less and if you go higher, you earn a bit more. By targeting certain niches and keywords, you can rank your tshirts high up in the listings for certain search terms. The great thing about Amazon, is that it has a crazy amount of traffic coming to it every day and many people are selling their tshirts with absolutely zero promotion. They’re just choosing good, low-competition, long-tail keywords that will position themselves well for their targeted audience – and wait for those sales to come in. Many people are calling this one of the biggest opportunities online right now, because it’s still very early on. Rumour has it that Merch will be expanding to other products in the near future, (not just tshirts) and to other countries too. They’ve been testing the UK with certain sellers for a while now, (being from the UK myself, that’s an exciting prospect). BUT – you do not need to be in the USA to sign up with Merch. I have signed up myself with Merch and was accepted at the end of June. Merch Is Invite Only Right Now! Currently, you need to apply to Merch and wait to be invited. Some people are accepted after a few months and some have been waiting over a year. There seems no rhyme or reason why some people are accepted over others. Personally, it took me around 2-3 months to be accepted and I didn’t put anything particularly special in my application. I did add my website URL, but plenty of people have been accepted that do not have websites. The best thing you can do is just go and sign up, because you don’t know how long the wait will be. Signing up with Merch, is completely free. While you’re waiting to be accepted to Merch, don’t just sit about waiting. This is what I did personally, but really – you should be getting designs ready and studying everything Merch related that you can. If you’re a designer anyway, then many people use Photoshop, or illustrator and if you’re not a designer, you can find a tonne of You Tube tutorials to get started. CANVA, (what I’m using now, the premium membership). Make Merch – is a cool design program, currently $19.99 a month. You also need to remember to create the correct sized images for Merch. The images all need to be 4500px by 5400px. How Many Tshirts Can You Upload? Anyone will tell you that the most frustrating stages of Merch, are in the beginning. Starting out, you can only have 10 designs live, (but you can upload others and save them in draft). You need to sell around 10 designs in order to tier up to the next level, which is 25. Some people have sold less than 10, others have sold more before they’ve tiered up. Next, you need to sell 25 shirts and you may be tiered up to 100. Then sell 100 to get up to the 500 tier and it goes up from there. When you have only 10 designs live, it can take weeks to get a sale. While others seem to manage it within days – this can all be down to what keywords/niches you’re targeting and the quality of the designs. Having read through various blog posts, listened to podcasts and watched YouTube videos, I noticed there is definitely some disagreement among individuals regarding some of the best MERCH SEO practices. So, I guess you need to go with what rings right with you, test and experiment as you go. These rules will probably change over time, but for now, this is what seems to work. I will run over some of what I’ve learnt and what has helped me so far, as well as having shirts rank highly in the Amazon search. For those of you reading this who already come from an internet marketing background, the concept of keywords will be very familiar. For those brand new, there may be a small learning curve, but really it’s pretty simple to understand – so, keep reading! Merch By Amazon Pricing – What Is The Best Price Point? This seems to flare up a lot of debate online. Certainly, not everyone agrees! That $19.99 works best, because at lower prices the shirts have a lower perceived value. Some say they had their prices low and when they rose their prices, they made more sales. 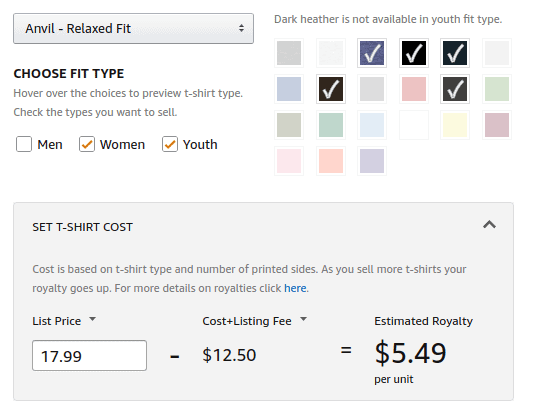 Some say to put your shirts out at a very low price to begin with, just to get out of the lowest tier. Then raise prices. Some day to research your competition and then roughly price your shirt slightly lower than a competitor that’s doing well, (as long as your shirt is just as good!). Some day – if you have a shirt with low competition, price it high. The higher the competition, the lower the price. The last one seems to make pretty good sense. Check out the market and work accordingly? Also, getting reviews can help your ranking. Once you get some great reviews, you could then consider raising your prices. Merch Brand Name – What Do You Choose? When you complete your listing, there is a brand name section. A lot of people on Merch opt for having a different brand name every time and to incorporate their keyword into the brand name. So, if your keyword was crazy cat lady shirt, for example – your brand name could be exactly the same thing – crazy cat lady shirts. I’ve personally found that using my keyword in the brand name is really important and yet something I’ve seen a lot of the competition overlook. Having a different brand name every time, can also stop copycats swooping in and stealing all your designs in one fell swoop. (While Amazon are trying to tackle copycats, it is quite an issue on the platform). For people browsing for your exact keyword, seeing it in your brand name will also be an additional thing to stand out for them – as it will be exactly what they’re looking for. What you include in the title, will depend on the competition. I check out the competition for keywords directly in Amazon. Although, I also use a regular keyword tool as well. This is because, often these exact keywords will be searched in google and Merch listings can appear on the first page of the search results. Using a keyword tool, can also give me additional ideas for long-tail keywords. So I search in Jaaxy for the keyword I’m thinking about. If there are some monthly searches there and there is low-competition, I go and take a look in Amazon. Ideally, I will want a keyword that brings up only a couple of hundred shirts or less. If your keyword brings up thousands of results, you’re going to have a hard time ranking for it. Now, you want to check those results on the first page. What keywords are they using and where are they ranking? You want to check out their best seller rank, (BSR). A great little tool for seeing how well shirts are ranking is Unicorn Smasher... it’s a free google chrome extension. A best seller rank, (BSR) of 100k will mean they’re selling a shirt every day. A BSR of 2000, they’ll be selling 25-50 a day. A BSR of 400,000, they’ll be selling a tshirt about once or twice a week. So, I tend to ignore the approx amount Unicorn Smasher says people are earning on average per month and focus on what the BSR rank is, which Unicorn Smasher shows you too. In the Amazon search bar, Amazon also auto predicts what you’re going to write next and this can be a good way of discovering keywords, as Amazon will come up with terms recently searched for. So, once you definitely have your targeted keywords and your title, you need to add your bullet points. Bullet points are what you put in after the title when you are uploading a design. Amazon will say that they’re optional – but they are definitely not if you want any hope of ranking! I’ve seen many Merch sellers do one of two things… leave out bullet points entirely or cram as many keywords as they can into the space. You should include keywords in your bullet points, but you want to include them in sentences that actually make sense. Apparently, the product description section doesn’t effect SEO, but I usually still like to fill it out. When Merch first started, it seemed like anything was accepted and thrown up on the platform. Therefore, people were putting up their own Disney shirts and so on. Now, they’re fully catching on to all of this and you need to be careful about what you’re putting out there. There are plenty of phrases that are trademarked, as well as images and people often don’t think of that when they’re writing their bullet points – then their design is rejected. You can get chucked off of the Amazon platform, if your shirts are constantly being rejected. So, it makes good sense to really look after your account. I found this blog post by Michael Essek useful, for explaining some of the copyright basics when it comes to tshirts. So, that’s some of the Merch basics to get you started! If you’re interested in learning more about Merch, below are some different resources that I’ve found useful and they’ll certainly keep you busy! This is my most recent side hustle and although I’ve only just started, I wanted to share with you what I’ve learnt so far – I’m sure it would be a great opportunity for plenty of you out there. What I’d like to happen, is to build this up as an additional income alongside affiliate marketing and additional income streams. So, what do you think? Are you going to give Merch By Amazon a go? Let me know in the comments. This sounds like a really interesting new idea from Amazon. I hope they will bring this to the UK site soon. I have been discussing the idea of designing T-shirts with my boyfriend for a while now (years), so I’m gonna show him this later on! I know it will come to the UK, they are trailing it. But you can start right now, I’m in the U.K. And it is simple to sign up in the US one.